This was my first Shakespeare song… the song that started me on a two year journey of Shakespeare song writing, not to mention the accompanying 600 page Master of Arts Thesis. 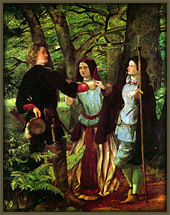 The song is sung by the character of Jacques in As You Like It. Similarly to Blow Blow Thou Winter Wind, it appears jolly on the surface but has an undercurrent of bitterness and even sarcasm. The jolly melody certainly gives no indication of all the work to come… why didn’t I just write a love song that day? !